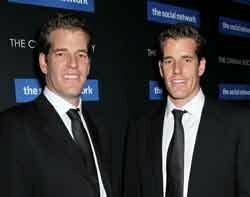 A US appeals court has ruled that twins Tyler and Cameron Winklevoss will have to be satisfied with the settlement they reached with Mark Zuckerberg in 2008. Facebook agreed to the settlement to end "rancorous litigation", but did not admit Zuckerberg had taken the twins' idea, according to BBC news. The Winklevoss brothers, who maintain that Zuckerberg stole their idea for the social networking site Facebook, were seeking to renegotiate the $65m settlement. The settlement was made up of $20m in cash with the balance in shares, now thought to be worth $140m, according to the San Francisco Chronicle. The twins claim Zuckerberg defrauded them by overstating the value of the shares when negotiating the settlement and they should therefore have the opportunity to renegotiate, but the US Circuit Court of Appeals in San Francisco upheld a federal judge's dismissal of the claim. The court noted that the brothers were accompanied to the negotiations by a team of lawyers and their father, a former accounting professor and expert on stock valuation. "At some point, litigation must come to an end. That point has now been reached," said chief judge Alex Kozinski, noting that the brothers had signed a release of all claims against Facebook in 2008.